Ask about green cars and most buyers think only of gas mileage. But there are other ways to make vehicles greener, including the use of renewable materials to replace petroleum-derived synthetic components. For its all-new 2013 Escape crossover, Ford has created door bolsters from a plant called kenaf. The bolsters, which insulate the interior from road noise, were made from oil-based resins in previous Escape models. Kenaf is a tropical plant in the hibiscus family, related to both cotton and okra. It most closely resembles bamboo. Its oil is widely used in the cosmetics industry, and its upper leaves and shoots are edible. Fibers from the kenaf plant can be used in paper, cardboard, and other packaging materials as well. The door bolsters in the 2013 Ford escape--basically stuffing inside the door panel--are made from a 50-50 mixture of kenaf and polypropylene. 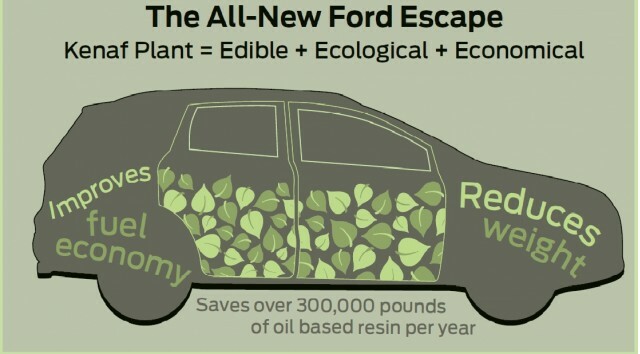 Ford says this reduces its use of oil-based resin by 300,000 pounds per year. The kenaf-based door bolsters have another advantage as well: They're 25 percent lighter than those in the superseded Escape. With stronger safety structures and more extensive standard and optional equipment, vehicle weight tends to grow with each new model. So every opportunity to take out weight counts. In the 2013 Escape, Ford has reduced the space needed for the engine (and hence the weight of some mechanical components) by eliminating a V-6 option. Instead, the new crossover will offer three four-cylinder engines: a base 2.5-liter four, and a pair of EcoBoost direct-injected and turbocharged fours, in both 1.6-liter and 2.0-liter displacements. The 2.0-liter EcoBoost develops the same power as the old 3.5-liter V-6 in the previous Escape, but is expected to deliver gas mileage up to 20 percent higher. Ford touts the array of recycled or renewable materials in the new Escape (and other vehicles as well, including the Ford Focus Electric). They include soy-based seat foam, carpeting made in part from recycled plastic bottles, and insulation that includes scrap cotton from blue-jean manufacturing. 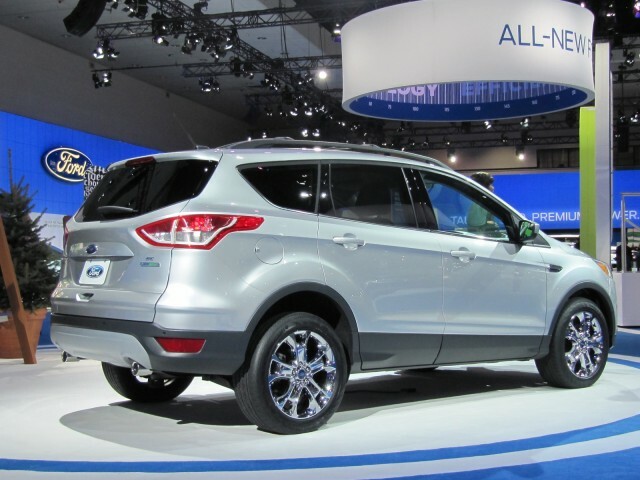 The 2013 Ford Escape will arrive at dealerships this spring.